This special offer makes taking a longer holiday an easy choice with discounts of up to 25% and complimentary daily buffet breakfasts. Take advantage of even more relaxation and excitement in a privileged boutique hotel stay. 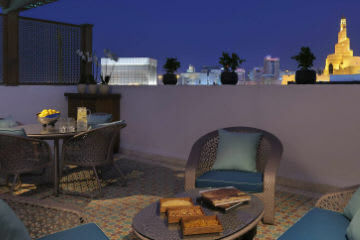 Extend adventure and romance in Doha for extra nights and save. Above rate is net per room per night and including maximum discount, subject to seasonal variations and change without notice. Minimum three, four or five night stays receive 15%, 20% and 25% discounts respectively. Offer cannot be used in conjunction with any other offer, discount or package, and is non exchangeable, transferable or redeemable for cash.